NEW ORLEANS — The City of New Orleans’ series of “open house” neighborhood workshops to engage residents about the upcoming plan to expand and improve the City’s bike network continues tonight with a District C meeting at KIPP Renaissance School (3820 St. Claude Ave.). The meeting will run from 6 p.m. to 7:30 p.m. The plan for the new network, known as Moving New Orleans Bikes, is led by the Office of Transportation in collaboration with the Department of Public Works, the City Planning Commission and community partners including Bike Easy and Blue Bikes. The meetings feature several activity tables where residents are asked to respond to key questions about mobility across the city to find safer, more accessible and more equitable options for cyclists as well as pedestrians, transit riders and auto drivers. Thursday, April 11 — District C, KIPP Renaissance School, 3820 St. Claude Ave.
Tuesday, April 16 — District D, AmeriHealth Caritas Louisiana, 3155 Gentilly Blvd. Wednesday, April 17 — District E, Martin Luther King Library, 1611 Caffin Ave.
Thursday, April 18 — District E, East New Orleans Regional Library, 5641 Read Blvd. 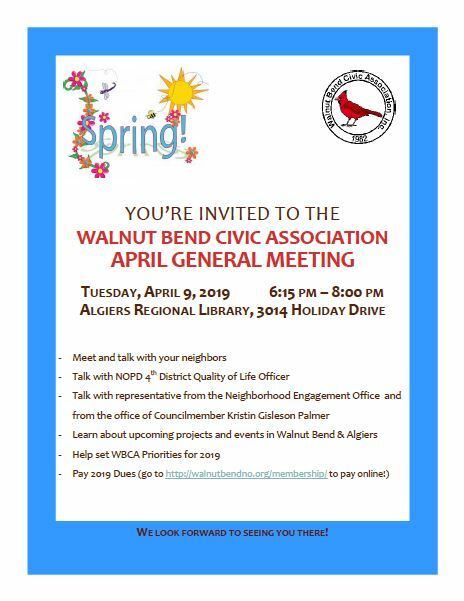 Click here to read the Walnut Bend April 2019 Newsletter. Entergy New Orleans will host Community Information Sessions in the coming weeks so that customers and other interested parties can learn more about the Entergy New Orleans Rate Case Filing. During the meeting, Entergy New Orleans will provide an overview of its September 21, 2018 proposed plan to meet evolving customers’ needs for utility service, its request for an overall reduction in rates and estimated effects on residential and small commercial customers. Entergy New Orleans representatives also will answer questions about the filing and the rate case process. 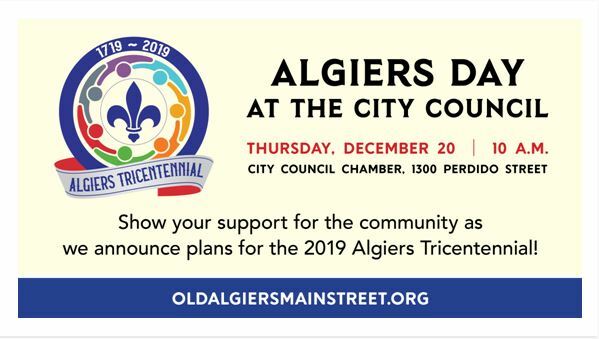 Wednesday, Jan. 9, 2019 from 6 p.m. – 7:30 p.m.
Tuesday, Jan. 15, 2019 from 6 p.m. – 7:30 p.m.
Wednesday, Jan. 16, 2019 from 6 p.m. – 7:30 p.m.
Thursday, Jan. 24, 2019 from 6 p.m. – 7:30 p.m.
Wednesday, Jan. 30, 2019 from 6 p.m. – 7:30 p.m.
Monday, Feb. 4, 2019 from 6 p.m. – 7:30 p.m.
Tuesday, Feb. 5, 2019 from 6 p.m. – 7:30 p.m.
Thursday, Feb. 7, 2019 from 6 p.m. – 7:30 p.m.
Tuesday, Feb. 19, 2019 from 6 p.m. – 7:30 p.m.
Beginning on Wednesday, Jan. 9, 2019, at 7 a.m., the City of New Orleans, Department of Public Works construction contractor, Hard Rock Construction, LLC, will close the south-bound lane of Holiday Drive at the intersection of General De Gaulle Drive. The closure will allow construction crews to repair a damaged bridge joint. 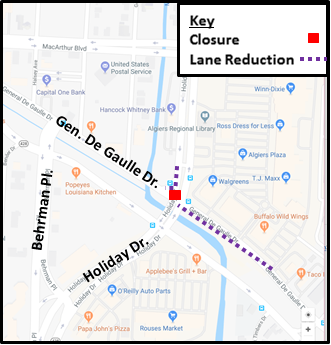 Public safety is our top priority; residents and commuters are reminded to use caution when driving, bicycling and walking near this construction site.